1. I am going to be doing this for a while, so I may as well go ahead and become the best caregiver I can be. What you think and what you feel are important. Are you trying to be the best caregiver you can be? If you think negatively the situation will remain negative. If you think positively the situation will turn positive. An effective Alzheimer's caregiver uses their brain to find ways to improve the situation. The more activities you engage in the better the situation becomes. 2. If I learn how to think of my love one as deeply forgetful, maybe I will stop thinking they won't do anything I want them to do. Let's face it. Alzheimer's is a negative word with heavy negative connotation. The word itself fills us with dread and a sense of hopelessness. 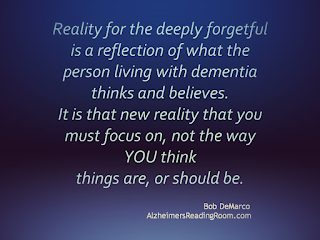 Reality for the deeply forgetful is a reflection of what the person living with dementia thinks and believes. It is this new reality that you must focus on, not the way YOU think things are, or should be. If you start asking yourself why, you will soon learn that the way a person living with dementia thinks and feels is normal for them. The goal in all communications with a person living with dementia should be to connect with them in a positive, constructive, effective way. 3. I wonder what it feels like to be living with Alzheimer's and I'm not talking about me, I am thinking about the person who I am caring for right now. How does a person living with dementia feel? When they are being mean, are they really being mean? Or, are they easily confused? How do you act when you are confused? I want you to imagine what it might feel like if you could not remember anything you just did. You can't remember when you last ate. You can't remember what you did today. Confusion and the inability to understand what is going on are an issue when caring for a person who is having their memory robbed by Alzheimer's. 4. My loved one used to like doing this and that, why did we stop doing this and that? I finally concluded that we were living in a cave. We had stopped doing the things that made us happy; and the normal things we were doing when we were living our life. I decided we had to start living our life in the way we had before the diagnosis of Alzheimer's. Once we started living our life the situation became more normal. As a result, I started acting "normal, and my mother started acting more normal also. This is what happens when you make it to Alzheimer's World. 5. I wonder what would happen if we started "living our life". Would we both feel like we are living our life? When Alzheimer's strikes there is a tendency to give up. You start by doing the things your loved one did in the same exact order they did them before the diagnosis. Then, you build on that routine until it becomes a pattern of living and pattern of behavior. What did you do before Alzheimer's? Sit at the kitchen table and talk? Run to the store? Eat at a restaurant? There is a tendency to think that persons living with dementia can no longer do things. This happens because caregivers are constrained by their own brains. I learned that a person living with dementia can usually do more than we can imagine. Let me put it this way. If you don't try you will be proven correct. They can't do things. On the other hand, if you do try you get kind of thirsty. Thirsty to find out what they can do. You'll soon learn that they can do more than you thought, and you get to do more than you thought possible. You have a life and you start living it. 6 articles that might help you become a better caregiver. 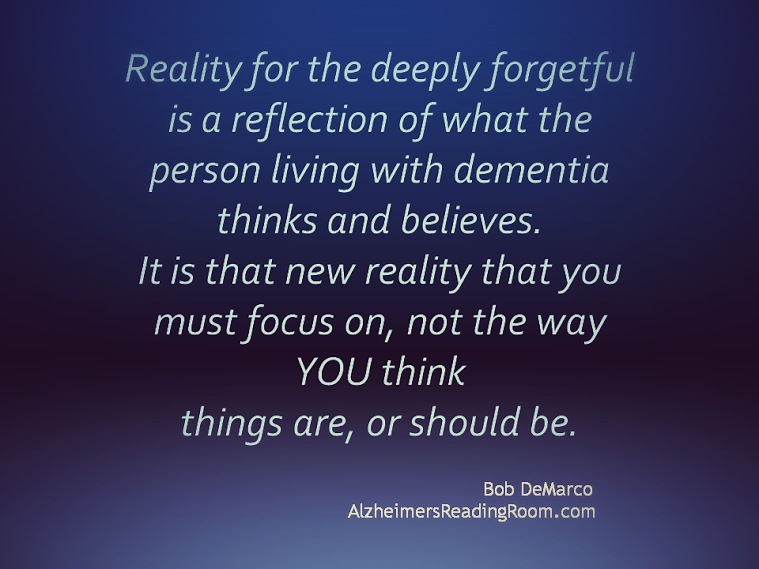 Bob DeMarco, Alzheimer's Reading Room, 2015, "5 Things Every Caregiver Should Say and Think to Themselves"